I've started eleven separate blog entries in the past 45 days. Each began with something that struck me as funny, or a moment of enlightenment, or a thought provoking comment. But they're all sitting unfinished in my blog queue. I feel a bit paralyzed, I think. I've come to think that my blogs must be meaningful and influential and profound, and so when the words don't fit right on the screen, or if I feel like I'm just writing words I've said before, or that I've read somewhere else, I am frustrated. And that a precarious position to place yourself in. Firstly, forgive my arrogance. How dare I take up an imaginary mantle that no one gave me to inspire and transform?! I felt that ego in the words I was writing. And they were ugly. Summer is usually my down time from reading. Throughout the school year, I read a lot of books outside of my course curriculum in order to stay sane, and then summer is dedicated to binge-watching an entire series in a day. But this summer I've been incredibly fortunate to stumble across some really excellent reads, and I thought I'd post some overdue mini-reviews and recommendations for some fantastic books to read this fall. In case you don't own a TV or a computer or a phone or ever check Facebook or Twitter or the internet ever, I have a surprise for you: J.K. Rowling released a book under a pseudonym this year! You can only imagine how elated I was when I heard the news. I mean, she gave us The Casual Vacancy not even a year ago, and now another book!? I was in reading heaven. A few months ago, I wrote this piece about British shows I loved and tried to get it published across the internet. I didn't have any takers (although it did get me an in to write other things for WhatCulture.com), but I still wanted to share it somewhere. I cannot deny the internet knowledge of fantastic television. British television is great. The internet knows that British television is great. It’s practically impossible to scroll through Tumblr or watch a YouTube vlog without seeing a reference to Doctor Who, or hearing a mispronunciation of Sherlock actor Benedict Cumberbatch’s name, or catching a spoiler for an episode of Misfits that you haven’t yet gotten to in your Netflix queue. There are some great series that have made it across the pond and into North American vernacular – Being Human, The Inbetweeners and The Hour, to name a few. Hello. I am an extrovert. There are a lot of us out there, but, ironically, we don't often talk about our needs under the heading of "extroverts." However, over the past year or two, I've seen a growing discussion around introversion online. And I think it's great. 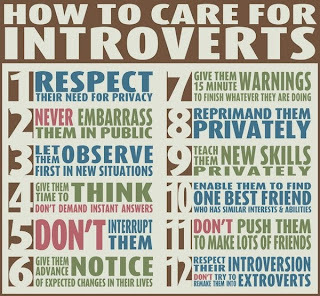 It's important to understand both our own and others' needs, and introverts have definitely been given the short end of the stick for a long time. But the problem is that, like many quest for labels and identity before it, the definition of being an introvert has been corrupted and corroded, and also glorified as this heightened mental state. And to be quite honest, it's alienating, annoying, and wrong. Here's the most simplistic definition for an extrovert: one who gains energy from being around people. Here's the most simplistic definition for an introvert: one who gains energy from being alone. I've been thinking a lot about makeup lately. Of course, I often think about makeup. I read upwards of 20 beauty blogs daily, watch makeup hauls and tutorials on YouTube regularly, stroll through Sephora and Shoppers once or twice a week. I give nail polish tips to those who ask (and those who don't), leisurely enjoy applying my makeup in the mornings, frequently try different lip-staining techniques to ensure the longevity of a red pucker, take pictures and write reviews on my own beauty blog about my favourite products. All of this makeup indulgence is just that: indulgence. It's a hobby for me. Colour and texture and technique. I like playing with and manipulating products to see what they can do, and how they will change my look. Indulgence. But as much as I claim that makeup is purely fun for me, that's not the whole truth. Makeup is also a crutch. It's been almost a month since I posted, and for no good reason at all. Luckily, this massive break in writing has given me lots of time for reading, which in turn gives me reason for writing, so I guess I've rendered my previous sentence moot. As you know, I have a certain penchant for comedian/writer autobiographies. Sometimes they are terrible (like Ellen Degeneres's Seriously...I'm Kidding); sometimes they are pretty good (like Jon Richardson's It's Not Me, It's You); but rarely are they ever fantastic. 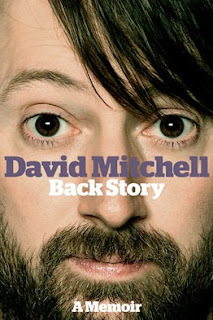 Which is why I deeply, unapologetically, and wholeheartedly loved every word of David Mitchell's Back Story. I love my birthday. From the minute we turned 365 days old, my parents have made a big deal of mine and my twin sister's birthday. Our first birthday was an elaborate affair, with a homemade cake from my grandmother and frilly dresses and balloons and far too many presents. And maybe that first birthday set the tone for the rest of our lives, or maybe because my mother was always very, very keen on making sure that my sister and I had a grandiose celebration that usually lasted about a week to show how happy she was that we were on this earth - whatever the reason, I have come to believe that my birthday is the most important day of the year. If you're anything like me - that is to say, an unemployed 20-something who spends a great deal of time dilly-dallying around social media and pop-culture news sites - you're sure to have seen the interview with Abercrombie & Fitch CEO Mike Jeffries where he openly states that he doesn't want fat people wearing his brand. In case you have more important things to do than derp around the internet, here's a brief summary: Abercrombie & Fitch doesn't sell women's XL or XXL clothing because Jeffries wants "good-looking people" to be the face and bodies of his clothing. He speaks about exclusion and how there are kids who are cool and those who aren't, and only the popular, pretty crowd are idyllic enough to proudly wear A&F garments. I don't date much. In the span of about 10 months in 2009, I went on about five dates (and two of those were "we didn't really say they were dates but we both knew they were; I could tell by the way smiled an extra 3 seconds at an unfunny joke" type dates). This whirlwind of romantic activity had never happened before, and has not been repeated with such fervour since. I've often lamented that I hate dating. I get nervous and awkward and, especially if I like the guy, my teeth chatter and feel like I'm going to vomit. My topics of conversation go down weird bunny trails so before I know it, our delightful conversation about some book we mutually enjoy has turned into a systematic recounting of all the ways to effectively poison someone in the 15th century. I adopt a laugh that is not mine, I never like my hair, and I'm too afraid that my lipstick has smudged to even listen to what he's saying. And who can ever figure out what to do with their hands?! You know what? February is a short month. Also, February is a busy time when you are a grad student. Scratch that; every time is a busy time when you are a grad student. So you'll forgive my forgetting that I actually have a blog until this week. A quick recap on what's happened in the past four weeks: I wrote some papers, I presented some of said papers, I went home and marked some other people's papers. There's been a lot of 8 1/2 x 11 in my life this past month. 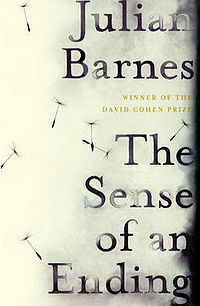 I've been meaning to post a review of Julian Barnes' 2011 Man Booker Prize winning book The Sense of an Ending since early January when I finished it, but I wanted to let the story settle and when it had, there just wasn't time. But since there will never be time, I'm doing it now, while my coffee is still hot and my fingers are agile. This is a fact about me: I complain a lot. I know this to be true. I complain about school and I complain about people and I complain about Facebook. I moan about badly made coffee and how my roommates don't buy milk and how I'll never find love. I mean, I sort of know why. Complaining is part of comedy. Most comedians base their standup routines around complaining about something, whether it's racial problems or the weather or their family or politics. And there's nothing I've ever wanted more than for people to think I am funny, and so I mimic (badly) the methods of the masters.